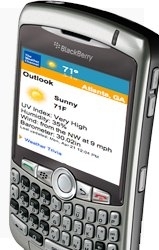 Win a FREE BlackBerry from The Weather Channel | BlackBerry Blast! The Weather Channel is running a promotion where you have the opportunity to win a BlackBerry every day until June 24. Simply go to the Weather Channel's web site every day and enter your email address for a chance to win. Once you log in, you'll be automatically entered to win the Weather Anywhere Prize Pack including a BlackBerry® smartphone, a high-definition TV, and a laptop computer!